Dec. 18, 2017 - NFCA Welcomes V&C Drywall Contractors Inc.
NFCA welcomes V&C Drywall Contractors Inc., Kapolei, HI, as a NFCA Contractor Member. Dec. 14, 2017 - NFCA Welcomes C.M. Morris Group, Inc.
NFCA welcomes C.M. Morris Group, Inc., Deerfield, WI, as a NFCA Contractor Member. Dec. 12. 2017 - NFCA met with the American Institute of Steel Construction to build a relationship to promote fire-resistance rated steel buildings. Watch for more in 2018. Nov. 30, 2017 - NFCA Welcomes Quikspray Inc.
NFCA welcomes Quikspray Inc., Port Clinton, OH, as a NFCA Associate Member. Nov. 27, 2017 - NFCA Welcomes Woods' Fireproofing Inc.
NFCA welcomes Woods' Fireproofing Inc., Parkton, MD, as a NFCA Contractor Member. Nov. 15, 2017 - NFCA Webinar Series "Fireproofing Injection Systems"
Carol Schary, President & Owner and Valentin Esaulenko, Technical Manager, Nathan Kimmel Company, present on Fireproofing Injection Systems. Presentation available in the Members OnlySection. Sept. 22, 2017 - NFCA's Fireproofing Symposium in Chicago a big hit. Thanks to UL for the tour. How to Build a Successful Safety Policy presented by Roger Tickner, Tickner & Associates, Richmond Hill, ON. Webinar available in the Members Only section. Sept. 2 - NFCA Welcomes Ryder Insulation, Inc.
Ryder Insulation, Inc., Houston, TX, as a NFCA Contractor Member. Substitution of Beams - Join NFCA and John Dalton, GCP Applied Technologies, on Wednesday, August 31st at 1:00 pm CST. The newest NFCA IFRM and SFRM Accredited Contractor. For becoming IFRM and SFRM Accredited through NFCA's Contractor Accreditation Program. National Firestop, Winnipeg, MB is NFCA's newest contractor member. NFCA welcomes C J Spray, Eagan, MN, as a NFCA Associate Member - AND - NFCA's 100th Member! J & M Services, Garden Grove, CA, NFCA's newest Associate Member, an equipment manufacturer and maker of the of J & M Mini Sprayer. Congratulations to The Harver Company, Oswego, OR, NFCA SFRM Accredited Contractor. Congratulations to Alltrin Ltd., Trinidad; and South Altantic Fireproofing Enterprise, Greensboro, SC; who have successfully completed the requirements of NFCA's Contractor Accreditation Program. received an award of excellence from NFCA President John Taglienti. Hugh laid a great base of programs for NFCA to build on. FOR SALE - Click here and check out the new For Sale Section for NFCA Contractor Members! May 3 - NFCA's 1st Contractor Member from United Arab Emirates. Welcome Rise & Shine Insulation & Fire Protection LLC, Abu Dhabi, UAE. Hoyer-Warner, Bensenville, IL is NFCA's newest Associate Member. April 26 - NFCA's work at the ICC's Code Development Hearings in Louisville, KY, for the 2018 edition of the International Fire Code went well. The Fire Code Committee gave some great pointers on how to public comment NFCA's proposalto identify the fireproofing installed in buildings. Look for NFCA's Code Committee to get involved on this one and submit a comment in late July. Join NFCA now to be part of the action!. April 21 - NFCA Welcomes Southern Insulation, Inc., Hyattsville, MD as a NFCA Contractor Member. NFCA Members make NFCA happen! April 15 - NFCA's Dallas Educational Conference Presentations have been posted to the Members Only Section at NFCA-online.org. Members, check them out now. Not a member? Contact Sandy@NFCA-online.org to join today and catch up on the knowledge. April 8 - NFCA Fireproofing Week in Dallas - Thank you to everyone who attended the 2016 NFCA Fireproofing Conference! Over 70% of NFCA Contractor Membership, along with Manufacturer Suppliers and Associate NFCA Members, gathered for a great week in Dallas! Go to News/Events page to read all about it. March 23 - NFCA Welcomes New Members! March 22 - NFCA Welcomes Ener-Spray Commercial Contracting, Rocky View, AB and Ener-Spray Pacific, Port Coquitlam, BC, as NFCA Contractor Members. March 15 - NFCA Welcomes Cornerstone Coatings, Commerce City, CO, as a NFCA Interim Contractor Member. March 14 - NFCA Welcomes Dyer Insulations Inc., Rockaway, NJ, as a NFCA Contractor Member. March 3 - NFCA Welcomes Island Diversified, Calverton, NY, as a NFCA Contractor Member. March 1 - NFCA Welcomes M.L. McDonald Sales Company LLC, Watertown, MA, as a NFCA Contractor Member. Join Bill McHugh, NFCA Executive Director, at 11:00 am CST, as he discusses the upcoming 2016 NFCA Fireproofing Conference to be held April 6-8, 2016 at The Adophus, Dallas, TX. February 19 - Upstate Specialty Coatings, LLC. Nathan Kimmel Company is celebrating 60 Years of Dependable Service. 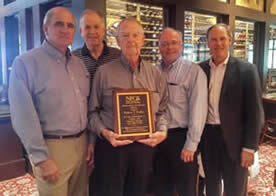 NFCA celebrates Nathan Kimmel Company for their support and dedication to NFCA and the Fireproofing Industry. Nathan Kimmel Company has been a NFCA since 2009. February 10 - EdanShield Construction Inc.
NFCA Welcomes new contractor member EdanShield Construction of Bradford, Ontario, Canada. and Darex Packaging Technologies join together to form a publicly traded company called GCP Applied Technologies Inc., which is completely independent of W.R. Grace & Co. For complete information go to gcpat.com. February 3 - UL's Communication clears up a lot. The Harver Company, Lake Oswego,OR. Now is a great time to join and support your fireproofing industry! K Building Specialties Inc., North Kansas City, MO. This brings NFCA Membership to 50 Contractors, 10 Contractor Branch Locations, 13 Associate Members and 4 Manufacturer Supplier Members, totalling 77! January 1 - Happy New Year 2016! Time to renew your NFCA Membership! Not a Member? Time to join! NFCA Welcomes new Associate Member Hardline Services, Fullerton, CA. December 17 - ICC's Board of Directors annouced a process to finalize the Public Comment Hearing votes. Visit ICC's Code Development Website for details. December 1 - Help fill the need and GIVE this Holiday Season! Visit Toys for Tots to donate toys and/or money and help brighten someone's Holiday Season in your local community. NFCA hosted 56 Architects, Specifiers, Building Code Officials, Fire Marshals and Fireproofing Contractors at the Passive Fire Protection Seminar in Tarrytown. The program was very well received. November 6 - NFCA Continues to Grow! Welcome New Contractor Member F. J. Construction, Mississauga, Ontario. NFCA Welcomes Alpha Insulation & Waterproofing, Round Rock, TX, as a NFCA Contractor Member, AND Alpha Insuluation & Waterproofing, Marietta, GA, as a NFCA Contractor Branch Member. October 15 - NFCA Monitoring Structural Load Calculation Methods - NFCA is monitoring the emerging issue of structural steel load calculation methodologies and the effect on selection of appropriate UL Designs. Please see this article from the American Institute of Steel Construction for more information. Join NFCA Now & take full advantage of NFCA Member Benefits. Complete your membership application TODAY! Frank Marino, CSP, Vice President of Safety Check, Inc., discusses current views from OSHA and OHSA Can, fireproofing scaffold safety, fall protection and more. This presentation is available in the "Members Only" section. NFCA's Board of Directors met in Chicago for their bi-annual meeting to discuss industry needs, NFCA prioities and actions for the new year. Bill McHugh, NFCA Executive Director, reviewed important changes and information for fireproofing contractors from the IBC 2009, 2012, 2015 Chapter 17 Special Inspections. This presentation is available in the "Members Only" section. July 29 - Donalco Western Inc.
NFCA Welcomes Donalco Western Inc.'s Calgary and Edmonton locations as NFCA Contractor Branch Members. Donalco, Inc., Toronto has been a NFCA Contractor Member since 2004. July 28 - WESTERN INDUSTRIAL SERVICES LTD.
NFCA Welcomes WESTERN INDUSTRIAL SERVICES LTD., Winnipeg, MB, as a NFCA Contractor Member. NDI Construction, Memphis, TN is the newest NFCA Contractor Member, investing in the fireproofing industry! NFCA welcomes Versatile Coatings, Inc., Azusa, CA as a NFCA Contractor Member. NFCA Welcomes new Associate Member PDQuipment, Oregon City, OR. The Donnelly Co., Inc., Victor, NY. Go to The Donnelly Co. NFCA Member Lisitng to learn what they have to offer! ADLER Fireproofing, Edmonton, AB. ADLER is the eighth NFCA Contractor Member to become accredited in 2015. June 22 - NFCA Associate Member Graco Inc.
Acquires Machine Technologies and will add their pumps and mixers to the product portfolio of Graco's Applied Fluid Technologies Division. Sobie Company, Inc., Caledonia, MI. NFCA thanks NFCA Member LK Knott, Hy-Flex Corp. Technical Services for a informative and well recieved seminar on fireproofing equipment maintenance and safety. This presentation is available in the "Members Only" section. May 19 - Watch for NFCA Webinars coming soon! One hour educational sessions on indsutry topics such as equipment maintenance, code changes, SFRM & IFRM products and inspections. The first webinar will be held June 10, 2015. Watch for registration and webinar details to come! Advanced Fireproofing & Insulation Co., Spokane Valley, WA, as the newest NFCA SFRM & IFRM Accredited Contractor. April 9 - NFCA Fireproofing Educational Conference - The sun was shining on the Fireproofing Industry all week long! Go to News/Events to read all about it. All conference presentations are available in the Members Only Section. April 1 - The number of NFCA Accredited Contractors continues to grow! Congratulations to Fireproofing Pros, Inc., Richmond, VA and Fred Shearer & Sons, Inc., Beaverton, OR, both NFCA Contractor Members who have earned the NFCA SFRM and IFRM Accreditation. Nov. 25, 2014 - Welcome New NFCA Contractor Members! 2015 Membership Invoices have been sent. Your 2015 Contractor Membership includes one FREE Attendee to the March Fireproofing Conference. March 9-13, 2015 - NFCA's Fireproofing Educational Conference, Annual Meeting & Contractor Accreditation Program Training - Join NFCA at Wild Horse Pass Hotel & Casino, Chandler, AZ, for this "Fireproofing Industry" Event! Oct. 1, 2014 - NFCA's Board of Directors met Sept. 23 & 24 to chart the course for NFCA's Future. Look for updates to documents, developments, and more each month at NFCA. Sept. 15, 2014 - NFCA's Membership Drive has us talking to many prospective members. We're looking forward to meeting them in March at the NFCA Annual Meeting. August 4, 2014 - Much is going on planning NFCA's Fall '14 and Spring '15 activities. Plus, we're reaching out via email and personal calls during NFCA's 2014 Membership Drive. July 17, 2014 - NFCA's Board and Committees keep working between Conferences. The Accreditation and Technical Committees are having discussions via teleconference and Board meets in September. Want to make a difference in the industry? Join NFCA. July 16, 2014 - NFCA's website has a brand new look, functionality and more. We're putting finishing touches on several different pages. Check back to see current news, updates and resources. July 7, 2014 - NFCA's New Website is coming. Check it out next week! June 15, 2014 - Several NFCA Contractors were Accredited in June. Check them out at the NFCA Accredited Contractor page. May 5, 2014 - NFCA's Contractor Accreditation Program continues to gain contractors who go for the accreditation. The program brings value through education and quantified knowledge through the exams. Join NFCA and take the SFRM or IFRM Fireproofing Exams later this fall. Watch NFCA-online.org for dates. April 23, 2014 - NFCA on a roll and membership is growing! Watch for more new Members as NFCA grows throughout the year! April 11, 2014 - What a great conference NFCA had in New Orleans, LA the week of March 21-26. Check out NFCA's Conference presentations in the NFCA Meetings section, NFCA-online.org. March 7, 2014 - There is still time to register for the NFCA Contractor Accreditation Program Education / Exams and the NFCA Annual Conference. Email us for more info. February 19, 2014 - NFCA Canada Members! Don't miss the Canada Committee Breakout during the NFCA Conference Thursday morning! February 17, 2014 - NFCA Conference Alert! The Louisiana State Fire Marshal's Office Cheif Architect Joe Delaune is speaking about passive fire resistance's role in Life Safety. Sign up now for the NFCA Annual Conference. February 14, 2014 - NFCA Annual Conference Flash! The American Society of Healthcare Engineers' (ASHE) Jonathan Flannery speaks Friday at the Conference. Don't miss this program on what a healthcare facility expects from a SFRM/IFRM Fireproofing Contractor. Febrary 3, 2014 - NFCA's Annual Conference & Education Week is coming up quickly. Registrations are rolling in and speakers preparing for you to attend and participate. Don't miss the conference. Email NFCA for info. February 1, 2014 - NFCA renewals for several firms are in the mail. Renew today to support the NFCA efforts to build programs that result in better fireproofing installations. The Contractor Accreditation Program SFRM and IFRM Education Sessions Monday afternoon & Tuesday prepare you for the SFRM/IFRM Exams Wednesday. Finish a great NFCA week at noon or stay the weekend in N'awlins. NFCA's special rate is $190/night at the Renaissance Arts Hotel. Make reservations online, or call 877-622-3056. Hotel Room Reservation Deadline, Feb. 25. Watch NFCA-online.org for an NFCA Agenda, NFCA Golf Outing, NFCA Conference Sponsorships and more, next week. The NFCA is pleased and excited to announce the appointment of our new executive director, Bill McHugh. With extensive management experience with industry associations, expertise in code development, and contacts throughout the fireproofing/firestopping industry, he is an abundantly qualified and highly skilled leader that will move the NFCA forward. By leading growth of the organization both in size and scope, Bill will elevate the NFCA in its mission to educate contractors and inspectors, recognize contractor excellence, and develop industry standards that promote the SFRM industry to the great benefit of its members and the life safety needs of the general public. The NFCA owes tremendous gratitude to Hugh Dudley, our respected founder and original executive director for over a decade. Hugh has retired to spend more time with his wife and family. During his tenure, Hugh created, led and promoted the association and the industry with dedication and skill. He established industry standards, educational programs and events, and multiple contractor accreditation programs. Hugh was not only a leader but a great team player who always listened to member concerns and worked very hard to deliver whatever result would most benefit the association, the members, and the greater public good. Hugh will remain a resource to the NFCA in the near term. The association will carry his vision forward while never forgetting his many, many contributions and steady, professional leadership. The NFCA is pleased to have the Plasterers Local 31 located in Munhall, PA and Underwriters Laboratories to join the NFCA as Associate Members. The Plasterers Local 31 is represented by Douglas Taylor and joined to work toward developing training programs for its members who supply workers on fireproofing projects. Underwriters Laboratories (UL) located in Northbrook, IL is represented by Luke Woods. UL is very instrumental in approving fireproofing products and approving fire rated designs used by the industry. There interest is to work with the interest on technical issues affecting both UL and the industry. Check out NFCA's Associate Members. Based on the IBC 2009 Building Code, Bulletin1001 has been revised to conform to the requirement that floor beams must have the same hourly fire rating as the assembly fire rating. That means that substitution of a 1-hour beam into a 2-hour Restrained Assembly is not allowed.Visit the Technical Information section of the NFCA web site (www.nfca-online.org) for a complete copy of the revised bulletin. We welcome Lawrence B. Wohl Inc. as an Accredited IFRM Contractor. View their accreditation on this web site and contact them to discuss your needs. American Coatings Corp. of Ashland, VA is the newest NFCA Accredited Contractor for IFRM. Stephen Winston recently completed the training sessions and passed the examinations as the DRI for the IFRM program under the NFCA Contractor Accreditation Program (CAP). We welcome American Coatings, Corp. as an Accredited IFRM Contractor. View their accreditation on this web site and contact them to discuss your needs. American Fireproofing, Inc. of Crown Point, IN is the newest NFCA Accredited Contractor for both SFRM and IFRM. Richard Hughes recently completed the training sessions and passed the examinations as the DRI for both IFRM and SFRM programs under the NFCA Contractor Accreditation Program (CAP). We welcome American Fireproofing , Inc.as an Accredited Contractor. View their accreditation on this web site and contact them to discuss your needs. MartinBros./Marcowall, Inc. of Gardena, CA is a NFCA Accredited Contractor for both SFRM and IFRM. Martin Rodriguez recently completed the training sessions and passed the examinations as the DRI for both IFRM and SFRM programs under the NFCA Contractor Accreditation Program (CAP). We welcome MartinBros./Marcowall as an Accredited Contractor. View their accreditation on this web site and contact them to discuss your needs. Newkem Engineers Pvt Ltd of Mumbai, India is the newest NFCA Accredited Contractor for both SFRM and IFRM. Kush Sura, Newkem’s DRI, recently completed the training sessions for SFRM and IFRM and passed the examAccreditated Contractor. inations for both DRI programs. The expanding fireproofing opportunities in the Indian construction market lead to Newkem becoming interested in the NFCA programs. We welcome Newkem as a NFCA Accredited Contractor. View their accreditation on this web site and contact them to discuss your needs. PDQuipment located in Oregon City, OR joined the NFCA as an Associate member. Dennis Mills is the member contact. PDQuipment is the material sprayers one-stop-shop. From tarps, parts, pumps, and more, they will supply you with whatever you need to get the job done. They are a company that provides service and equipment to the United States and across the globe. With over 25 years of experience in the business we can be your purchasing agent. Their web site is www.pdquipment.com. Welcome to the NFCA. T. J. Weis Contracting, Inc.
Newkem Engineers pvt Ltd located in Mumbai, India joined to learn more about the SFRM and IFRM application since many projects are designed using UL Fire rated designs. This is the first international member for the NFCA. Mr. Kush Sura is company representative. Toman Brothers, Inc. of San Antonio has been in the business of fire protection applications for the past 35 years. Their interest lies in the DRI program and its use in the market to help distinguish their company from others. Mr. Ross Toman is company representative. Rueter Insurance of Philadelphia, PA joined to learn how they can improve their position in the Philadelphia fire rated market. They currently write many policies for construction projects. Mr. Joseph Rueter is company representative. View their contact information on the “MemberLists” page of the NFCA web under “About NFCA”. The NFCA President, Mike Nehnevajsa, announces the formation of a Canadian Committee within the NFCA. Canada is covered by different structural engineering principles, a national code, and some differences in the UL product approvals. These differences need to be met by the committee who can focus the issues that Canadian contractors deal with on a daily basis. Don Falconer, President of Falconer Engineering & Testing located in Whitby, Ontario Canada has been appointed chairman. Don, an Associate Member of NFCA, has years of experience in the Canadian market first with A/D Fireproofing and recently with Carboline and their respective SFRM and IFRM products. The NFCA announces an Accredited Contractor program for NFCA members who install Spray-Applied Fire Resistive Materials (SFRM) and/or Intumescent Fire Resistive Materials (IFRM). The purpose of this program is to set a standard that requires an educational effort on the contractor’s part resulting in an improvement in application of industry products in accordance with agency product approvals and building code compliance. The heart of the program revolves around the contractor having at least one Designated Responsible Individual (DRI) in the contractor’s organization. The DRI must have participated in a NFCA DRI training program and passed an examination of the learned knowledge. The NFCA training program and examination covers agency product approvals, agency design procedures for products, and the application of fire resistive materials in accordance with industry procedures. In addition, the DRI must continue learning through yearly educational requirements. The contractor must have been in business applying industry products for two years, received training in application of manufacturer’s products, and a member in good standing in the NFCA. Two SFRM contractors, Easley & Rivers, Inc. of Monroeville, PA and Raymond-Southern California, Inc. of Orange, CA met the program requirements and have been awarded the NFCA SFRM Accredited Contractor logo. Details of the program and how to participate may be found under the tab "NFCA Accredited Contractor". DRI training programs for SFRM and IFRM contractors will be held March 20-21, 2012 at the MGM Grand Hotel, Las Vegas, NV. Check the DRI training announcement on this web site under NFCA News.. The NFCA announces the availability of a free training program for inspectors who conduct special inspections of SFRM and Intumescent Materials. This program may be found in the ICC Inspector section of this web site along with operating instructions. This training program was created to provide the tools necessary for a special inspector to properly conduct the inspection and testing of applied products in accordance with the IBC code requirements. The industry encourages the person completing the training to become a ICC Certified Inspector for SFRM and Intumescent materials. Information on how to become a ICC Certified Inspector is also on the instruction page. The program covers the areas of code requirements, thickness testing, density testing, and bond strength testing for SFRM and thickness testing for Intumescent. All of this testing by a special inspector is required by code following the application of these products. Should you have comments on the training program, contacts us via e-mail at Inspectortraining@nfca-online.com. Several changes affecting Fireproofing will be published in the 2009 edition of the ICC International Fire Code. • In 703.1, an annual visual inspection of accessible fire-resistance rated construction by the owner is required. Systems must be properly repaired, restored or replaced when damaged, altered, breached or penetrated. This change should increase the reliability of installed fireproofing throughout the life of a building. The changes will promote the use of products on these high risk buildings that meet the bond strength requirements now stated by the 2009 code. • Table 503 – Allowable Height and Building Areas will have the height reduced by 1 story for Type III B buildings. More business, mercantile and storage buildings will fall under Type IIA which will require a 1 hour classification. NFCA supports the work ICC's Membership did in code development cycles to improve safety in buildings using fire resistance rated construction.